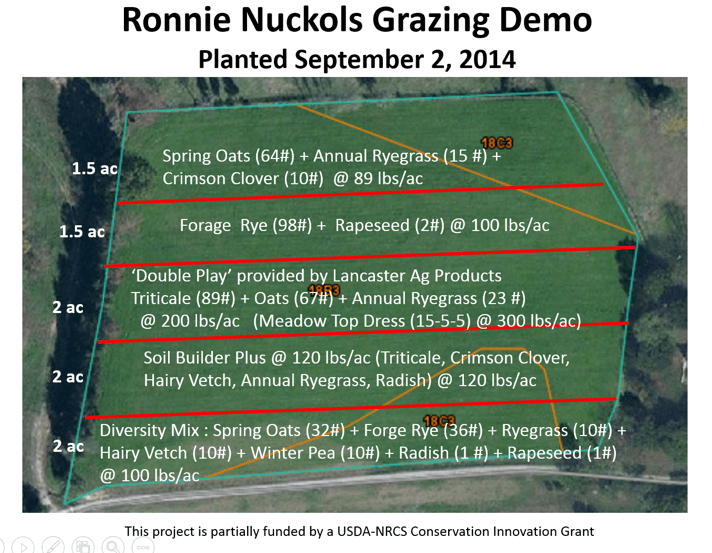 Ronnie Nuckols agreed to plant five different annual forage mixtures in large strips across one hay field. After the second cutting of Teff hay the summer of 2014, the field was desiccated to kill all vegetation in preparation for a fall planting. 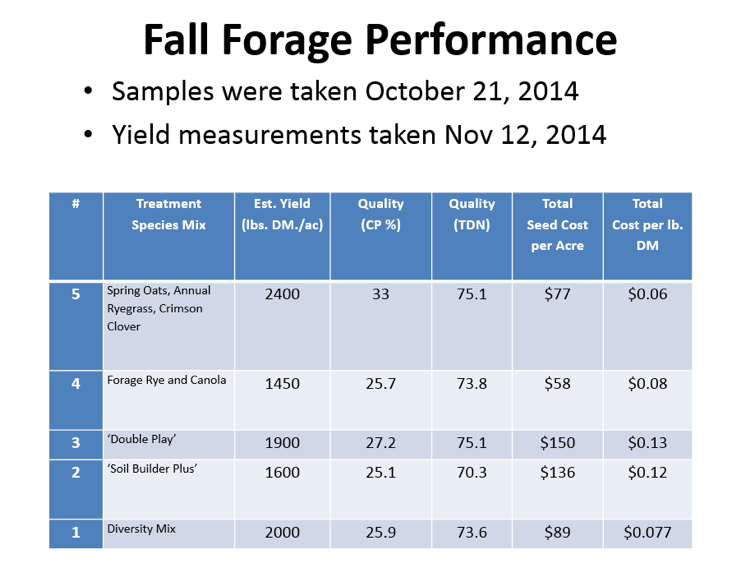 The following seed mixtures were planted on September 2, 2014 and fertilized after planting. Weather was hot and dry after planting but about 3 weeks after planting a good rain fell, the seeds sprouted and grew well the rest of the fall. 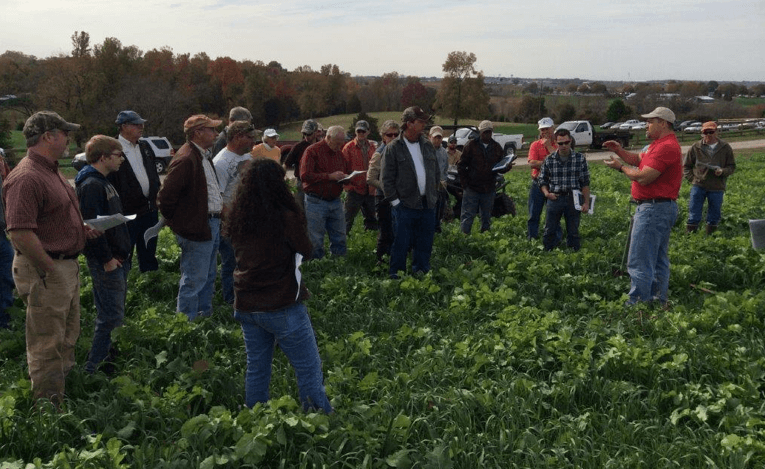 By November 4th the forages had grown well and a field day was held for farmers from the area to see what some of these plants were and how well they grew in mixtures together. With an early fall planting the growth potential on some of these mixes is tremendous with proper fertility and optimum fall growing conditions. Treatment 1 was the ‘Diversity Mix’ provided by Greencover Seed. 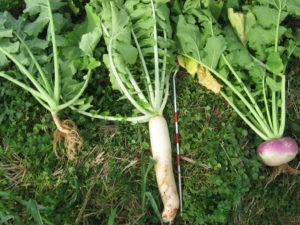 It included 3 grasses, 2 legumes and 2 brassica species. It provided excellent ground cover and growth in the fall with a good mix of species from different functional groups in an effort to boost soil microbial activity. 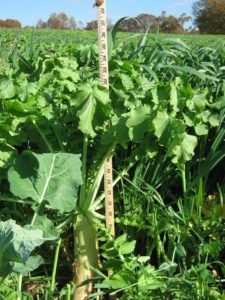 Treatment 2 was the ‘Soil Builder Plus’ mix provided by Kings Agriseeds, Inc. 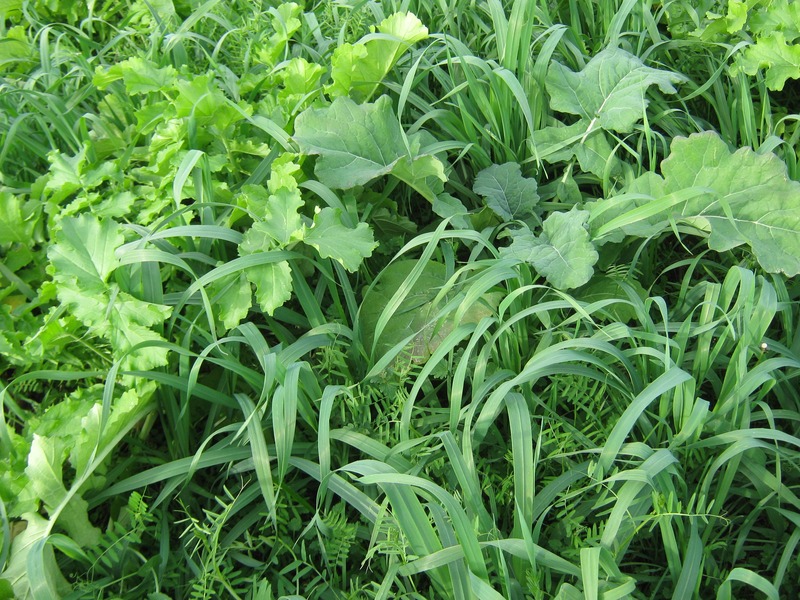 This mix also provided high diversity including 2 grasses, 2 legumes and a brassica species. 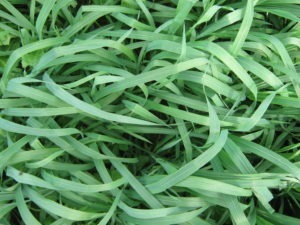 Treatment 3 was the ‘Double Play’ mix provided Lancaster Agricultural Products. 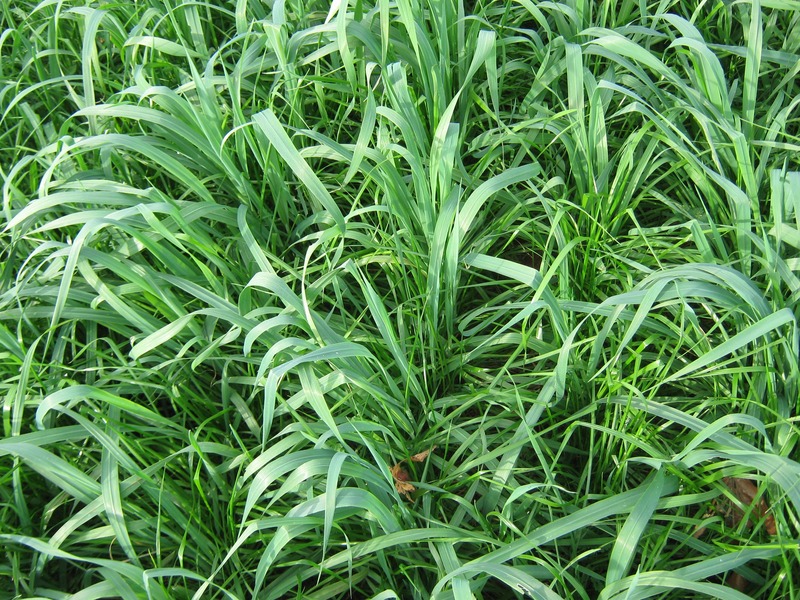 This is a simple mix of 3 grass species including spring oats, annual ryegrass and triticale known for growth and quality in the fall and regrowth again in the spring. 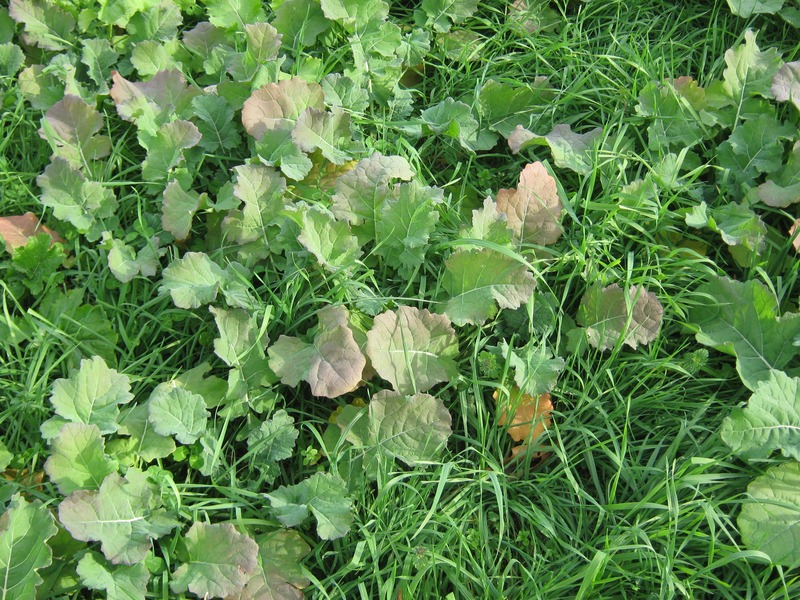 Treatment 4 was a simple two-way mix of forage rye and rapeseed. It was blended to hopefully provide good fall growth with only a little diversity at a lower cost. Treatment 5 was a simple 3 way mix of spring oats, crimson clover and annual ryegrass. 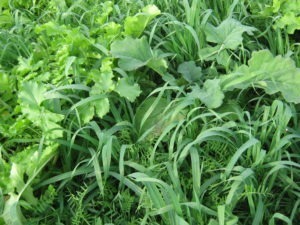 It was blended to provide good fall growth and good spring growth both with a legume component. 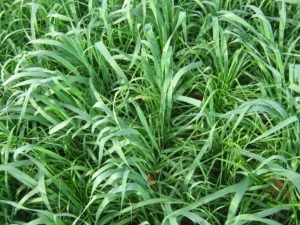 The spring oats dominated this planting in the fall. 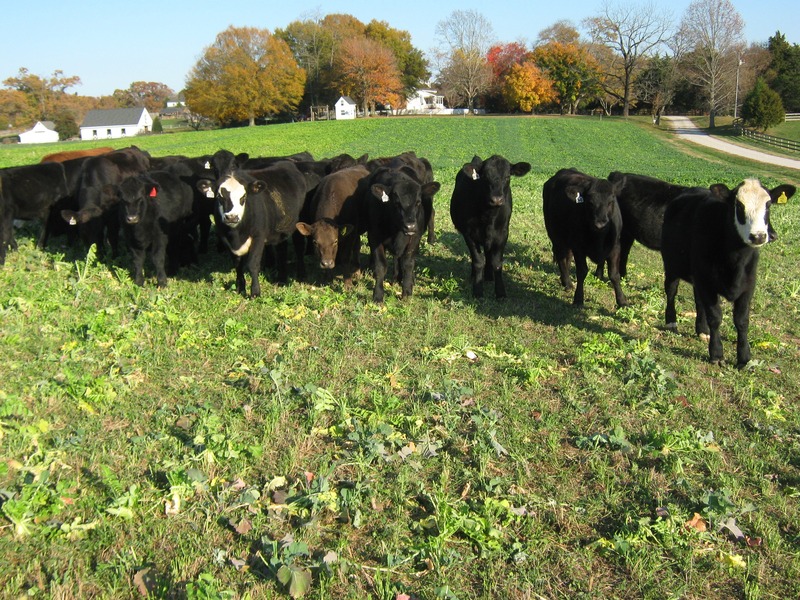 All five winter forage mixes grew well and 22 yearling heifers were introduced to the demo and began grazing on November 3rd. 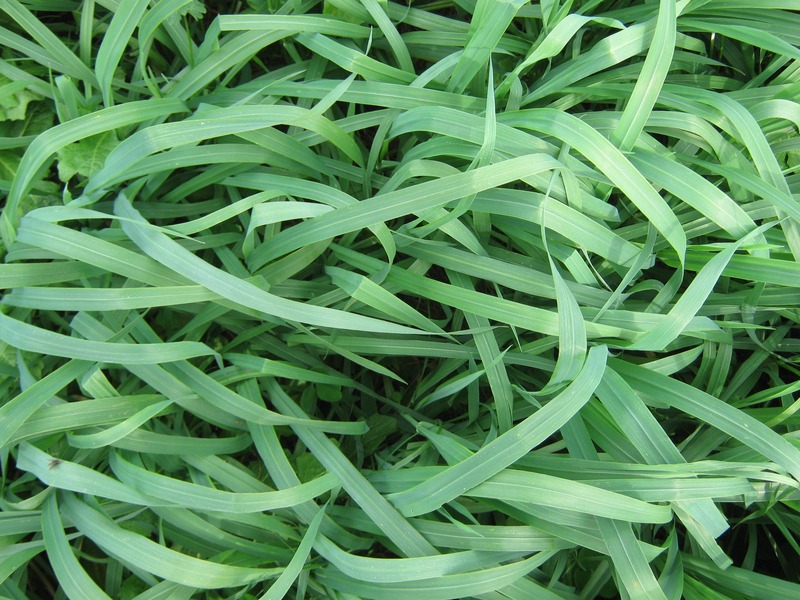 Due to the high quality and moisture content in these forage mixtures, dry hay was provided free choice. The high diversity of the plant species in some of these mixes resulted in different plant height, leaf shapes and rooting structures. This can sometimes be a complimentary benefit to yield not to mention the positive effect of different plant sugars exuded from the roots supporting a more diverse population of soil microbes. 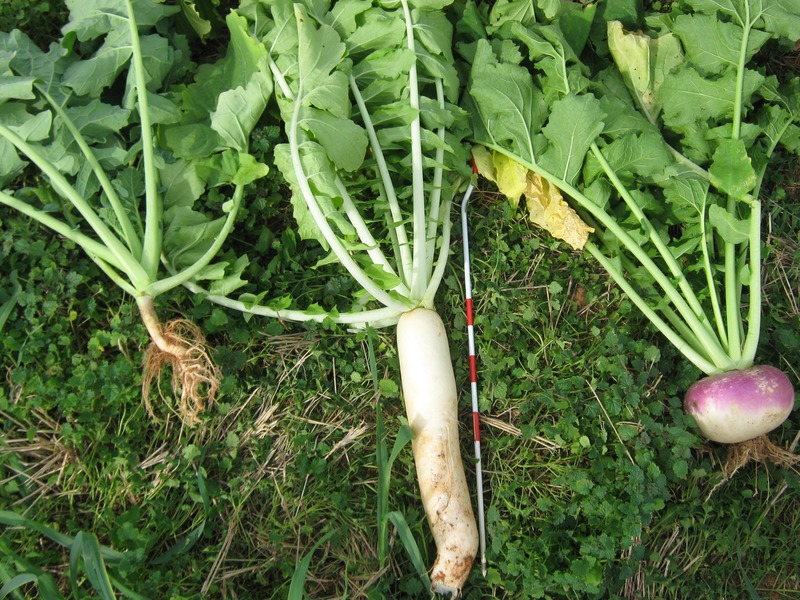 Some of the root structures on these brassicas are known for their soil penetrating ability and for bringing nutrients up from deeper in the soil to the surface horizon. 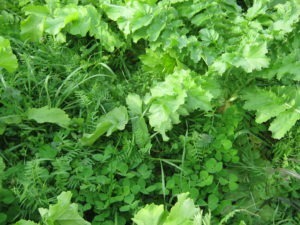 All five winter forage mixes grew very well in the fall on the 9-acre demonstration. Yield, quality and relative cost per mixture is summarized in the table below. 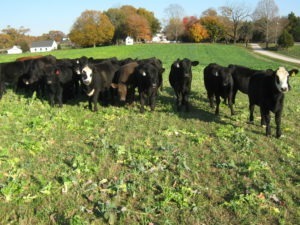 This group of heifers strip-grazed these annuals until December 10th for a total of 37 days. This provided a high quality, fresh forage supply for this group to allow the fescue pasture to stockpile longer before being grazed. 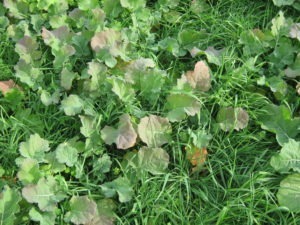 Good ground cover remained after grazing to provide basic soil protection to overwinter before regrowth in the spring. 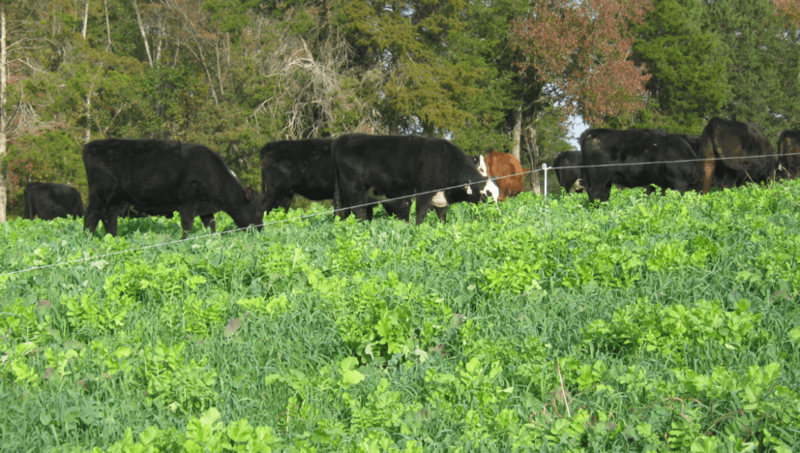 This is not replicated research data, it is a structured forage and grazing demonstration where samples were taken and analyzed and the results were summarized for educational purposes.